Many of our best childhood memories center around thumbing through old scrapbooks or digging through old foot lockers. 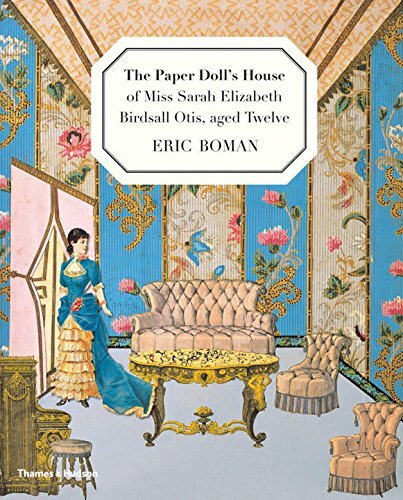 One book that conjures those warm and fuzzy memories—absent the stale or musty smell—is The Paper Doll’s House of Miss Sarah Elizabeth Birdsall Otis, Aged Twelve Years by Eric Boman. The Paper Doll’s House is actually more than just a fantasy house with fantasy inhabitants. Conceived and constructed by precocious twelve-year old Sarah Elizabeth Birdsall Otis (Birdie for short), this adorable collector’s item has more than the usual figure drawings and paintings one might find in a typical paper doll book. Instead, it has furniture and clothing from mail-order catalogs of Birdie’s day (1884), scraps of wall-paper and trimmings, and simply everything a dreamer needs to go back to the paper doll days of yesteryear. Everything about Birdie’s doll’s house spells opulence. There are flowing ladies’ gowns of astonishing color, lovely parasols and umbrellas, lush wall paper patterns and finely-crafted antique playing pianos, washing bowls, oil lamps and other furniture. There are lovely staircases, patterned floor tiles, lovely high-backed chairs near the fireplace and rich furnishings with exquisite details that are the stuff that the young (and the young at heart) dream of. Anyone who cherishes their paper doll days will love the meticulous conservatory, the pastel dressing room, the two nurseries, the sitting rooms and various dressing rooms. As young children thumb through the pages, they can engage in openended play and do so while learning all about what life looked like in the 1800s. One note: Although the illustrations and cutouts are the stuff of every young girl’s dreams, the text is not. Mr. Boman relays the twists and turns of Birdie’s story: who she was, how her mother bought the ancestral home that was the focal point of the doll’s house, and how Birdie grew up to be an outspoken member of society. This storyline and the vocabulary Mr. Boman uses to tell strays from the paper doll fantasy into stark reality and will almost certainly prove challenging for the young audience for whom the paper dolls were created; however, the fact that there are actual paper dolls with matching clothing and accessories in the back of the book will surely make up for this problem. Perfect for a history, writing, art, or fashion project.